The social networking giant recently added $9 billion to its share repurchase authorization. Last week, Facebook (NASDAQ:FB) announced that it was substantially boosting its share repurchase program, with the board authorizing a hefty $9 billion increase to the authorization. That's in addition to the $15 billion that was already previously authorized in 2017. Of course, it's up to management's discretion when and how to proceed with the buybacks, and there is no expiration date for the repurchase program. The "best risk/reward" and an "extremely attractive current valuation"
The increase comes as Facebook shares have lost over a third of their value since peaking in the summer. Facebook's second-quarter earnings release included gloomy guidance for the back half of the year, while the largest social networking company continues to grapple with a never-ending string of scandals and controversies, such as the recent revelation that it seriously considered directly selling access to user data. 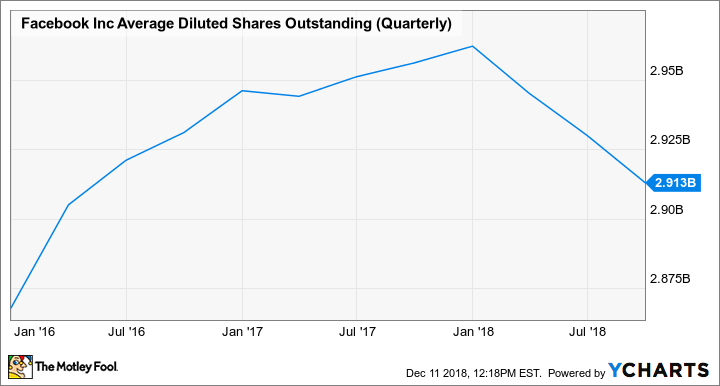 While companies generally aren't good at timing share repurchases, the news does suggest that Facebook currently considers its stock to be undervalued. It's also worth noting that despite the scandals, Facebook's user metrics remain surprisingly resilient, which is what advertisers -- the company's paying customers -- care most about. Additionally, repurchase programs can generally help prop up shares. Deutsche Bank analyst Lloyd Walmsley put out a research note just yesterday defending Facebook shares, arguing that all of the negative sentiment and related pullback has led to an "extremely attractive current valuation." Walmsley considers Facebook "the best risk/reward in large cap internet" stocks. The analyst is maintaining a buy rating and has assigned a price target of $195. 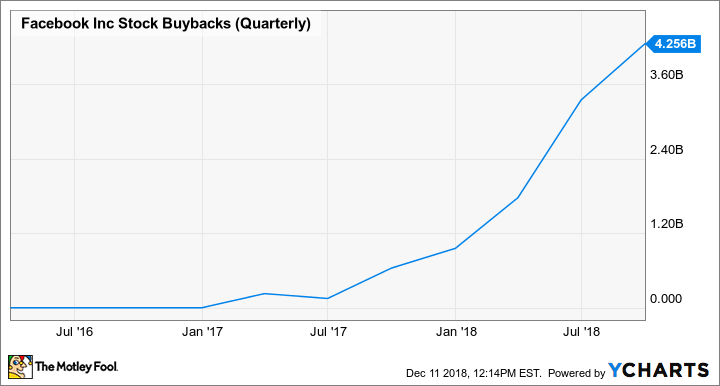 Facebook has been ramping up its buyback activity in recent years, and can easily fund repurchases with free cash flow. The company generated over $4.1 billion in free cash flow last quarter alone, and had over $41 billion in cash and cash equivalents at the end of the quarter. Of that total cash, $13.6 billion is held overseas, but last year's tax reform freed up overseas cash for all companies, making it easier to repatriate cash without adverse tax consequences. FB Stock Buybacks (Quarterly) data by YCharts. Buybacks that only mitigate dilution from stock-based compensation deliver little value to public shareholders, but fortunately all of the recent repurchase activity has started to reduce shares outstanding, translating into earnings accretion for investors. FB Average Diluted Shares Outstanding (Quarterly) data by YCharts. Facebook still has plenty of issues to address, but the buyback boost might calm some investor unrest for now.